Brownie, Black Forest, Mocha Crumble Or Oreo Kitkat: Let’s Sundae With Keventers Everyday! Whether you’re in the mood for a Guilty Pleasure or finding the Yin to your Yang, Keventers has discovered the secret to making it a Sundae every day. Every Winter, as we hug our sweaters a little tighter, we always crave the foods that always comfort us. This becomes especially difficult when you know you have to wake up early in the morning for that meeting at work or making sure you’re in time for your first class. In the midst of these constant winter induced blues, Keventers found a way to make it balmy for us. When we discovered that they had launched sundaes to comfort us like a warm hug, you know we just had to try them out. Wouldn’t mind getting caught red-handed with chocolate overdose? 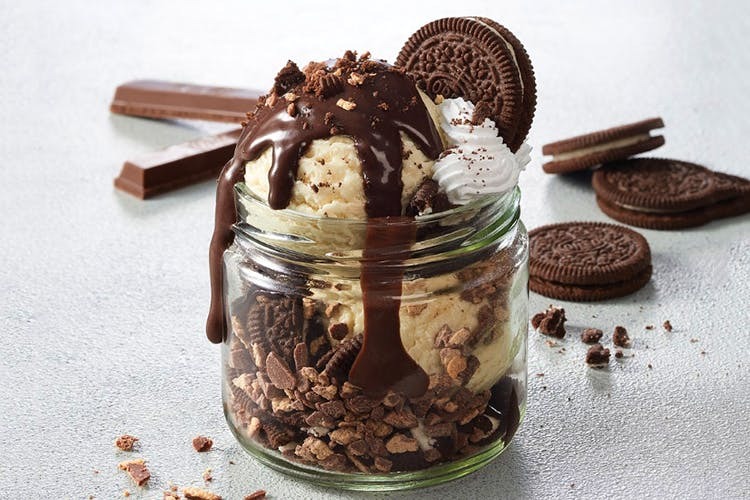 Grab a jar of Guilty Pleasure Sundae that packs lots of chocolate crumble, dollops of chocolate ice cream, sweet mocha syrup and chocolate sauce throughout. Spilling the beans with your bestie on all the pending gossip becomes so much easier with this one! Wrap yourself in some dark chocolate goodness with the Dark Conspiracy Sundae. This one’s loaded with chocolate cookies and chocolate wafers in cahoots, with lots decadent chocolate sauce and whipped cream. Sounds like the perfect mid-day indulgence, right? Can’t decide between the richness of chocolate or fresh vanilla? Find the perfect balance with the Yin & Yang Sundae. It is a celebration for anyone who likes the combination of both vanilla and the timeless wisdom of chocolate sauce and chocolate chips. All of this blended together with gooey chocolate sponge. Advance your love for sweet temptations with the Forest Forbidden Sundae. It’s loaded with chocolate sponge cake and vanilla ice cream, bathed in chocolate sauce and whipped cream. The fresh cherries on the top add to the temptation of this one. You won’t stop scooping through this interesting medley of flavours. These sundaes will set you back by anything between INR 199 to INR 249, but who wouldn’t mind a sweet treat at least once in a while? Hit up the nearest Keventers store to try them out or, order away on Swiggy for special introductory offers! Stay tuned to their updates on Instagram and Facebook.